Harbor. 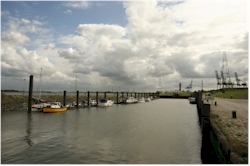 The small harbor of Doel is mainly used as a marina and is the setting for the yearly "Scheldewijding" (the blessing of the Scheldt) in August. The banks of the Scheldt. 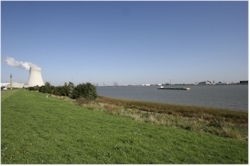 From the wide dike at the Scheldt river you have a great view on the polders and the village on the one side and on the port of Antwerp and Fort Lillo on the other side of the stream. Nuclear power plant. The cooling towers of the nuclear plant are without a doubt the most typical sight of the village. The site is situated north of the village center, close to the Dutch border. The complex constists of four reactors, of which the first one is in use since 1975 and the last one since 1985. There is an information center that can be visited [website].